Girls, do you recognise these things? Yup, they're pretty much the essentials when it comes to THAT time of the month. I have been suffering with menstrual cramps and PMS since my teenage years when "it" comes and it's NOT a good feeling. So during that monthly cycle, these are some of the things that I need to get through the first two days.. Sometimes it gets so bad that I have to take the day off work or school to stay home and rest >.< It can really affect a girls' performance at work but fret not, there is now a simpler and safer solution to beat the evil cramps!! Things that I need to go through the first two days of my period - a warm beverage (usually green tea or hot chocolate), SLEEP, a good book, my phone and laptop for entertainment, and the most important of all - a hot water bottle to ease the cramping. Oh, and painkillers. It's bad, but I can't get through my period pain without the pink Panadol pills >.< I'm usually just immobile and weak, lying on my bed on the first day of my period. It was worse when I was younger, the pain would be so bad that I'd go to the toilet a million times or just vomit. Now that I'm older, the pain is somehow more bearable but still uncomfortable. Sometimes I wonder how the tiny uterus can cause so much pain to a person! But guess what? More than 50% of menstruating females face some form of menstrual pain, so you're not alone! Here's where MenstruHeat steps in to combat that problem of inefficiency and pain during your period days! Ok lah, admittedly it can only solve about half and not all of the problems faced when having cramps, but that's better than nothing! 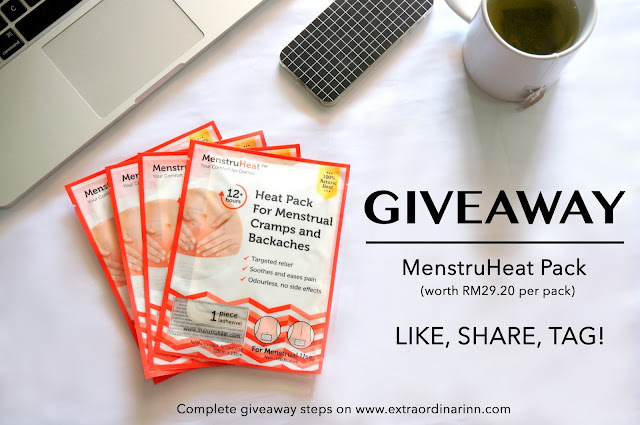 MenstruHeat is a flagship product by PSLove Singapore and is a 100% natural heat therapy pad to combat cramps and backaches. These pain can lead to headache, mood swings and breakouts as well, as if the pain itself wasn't enough we girls still have to deal with bad skin and hormonal change :( MenstruHeat was conceptualised to help alleviate and ease menstrual cramps & backaches. MenstruHeat uses all-natural heat therapy, a clinically-proven method to help provide targeted relief and soothe pain. It also promotes blood circulation, bringing more oxygen to the affected area so as to prevent anaerobic cramping. MenstruHeat is odourless and has no side effect. The heat pad functions like a hot water bottle to provide heat relief, but this is instead more discreet, highly portable and convenient to use even on-the-go, without you having to fill the bottle with hot water! The gradual gentle heating technique reaches a therapeutic temperature that will remain steady for up to 12 hours long. This prevents instant burn on the skin, yet is able to effectively relax the uterine muscles to ease discomfort. I was given the standard pack of 4 pieces of MenstruHeat in the package. You can opt to get 2 - 10 pieces delivered to you on a bi-monthly basis. It's only RM29.20 for 4pcs, including shipping! How worth it is that! Once you open up the MenstruHeat pack, you'll see this flat white heat pad with an adhesive sticker at the back. There seems to be some kind of bits & bobs that feels like dried herbs and leaves inside the pack, but it's still pretty soft and smooth when in contact with the skin. Remove the adhesive slowly and stick the pad directly onto your skin, or on your clothes. The heat pad heats up within 10 minutes when in contact with air, no shaking or microwave needed to activate the heat! It is extremely safe to use even throughout the night and contains NO medication whatsoever. The ingredients are mainly traditional herbs used in home remedy. By just peeling and pasting, you are able to relief the pain and get on with your daily activities. It is recommended to stick on 2 - 4 hours before the pain hits as heat takes time to penetrate the body, if you are able to predict when it'll hit, that is. Remember to monitor the heat level at all times and switch up the usage to suit your needs. I've personally had the 'best period of my life' when I first used MenstruHeat! I was pleasantly surprised to find that the heat actually lasted 24 hours, instead of 12! Not only did it last through the night in my air-conditioned room, I could actually feel the heat adjusting itself according to my room temperature (does that make sense?). It did get too hot at some points so I had to remove the heat pad and put it on top of my clothes. I even placed it on my back to relief my backache. I usually experience the most pain on the first and second day, but this time once the pain of Day 1 is over, I got through the rest of Day 2 pretty easily too! For once, I could actually get work done while on my period AND without the use of medication at all. Plus, it's such an affordable solution - you literally only need 1 or 2 pads to get through the month. I'm pretty sure you can use this heat pack for other uses too aside from only specific times of the months; get creative! My only qualm is that the adhesive can be quite tedious to tear off in one clean strip and does leave residue behind, making it not sticky and it doesn't stick that well to clothing. I later found out that it was a production issue but MenstruHeat has thus addressed the issue here. - The heat lasted up to 24 hours instead of the 12 hours stated! That's ONE WHOLE DAY! - Safe, odourless and effective, I no longer have to take pills to kill the pain! - The adhesive can be a little problematic. If you discover a problem with your MenstruHeat, don't hesitate to contact them at peckying@pslove.com for a free replacement! - Giveaway will last for a week from Tuesday, 24 May to Wednesday, 1st June 2016 (11.59pm). **EXTENDED TILL 3RD JUNE 2016!! Don't be afraid to talk about these feminine issues. Read more feminine tips & tricks from PSLove on their blog and find out more about MenstruHeat! Disclaimer: Even though the product is sponsored, the review is based on my own honest personal thoughts, experiences and preference after trying out the product. Effects may vary depending on individual. HELLO CARINNNN :D Awesome blog post! This is a life saver for lady.